Umore Ona Bi i San Sebastian, Spania: Bestill nå! 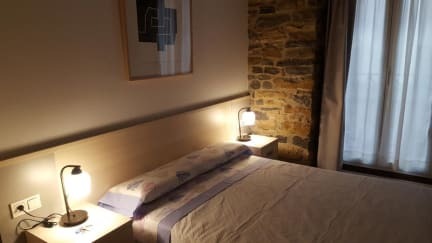 Because of the recent renovation and the constant satisfaction of the many visitors through the years, Umore Ona Bi Bed and Breakfast has been recommended by various guide books such as Let's go Europe, Let's go Spain, Lonely Planet, The Rough Guide and others. Umore Ona Bi Bed and Breakfast offers single, double, triple rooms and also for four people. 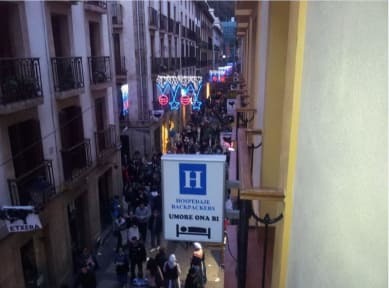 There are three bathrooms for five rooms and all the rooms are looking to the street of San Sebastian. They also have central heating and TV. Credit Card is accepted but unfortunately debit cards are not.